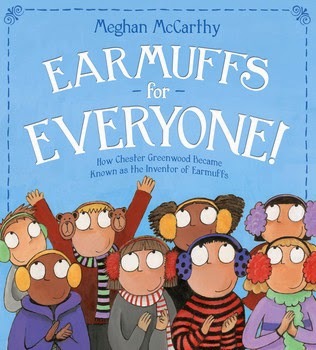 In Earmuffs for Everyone, the clever and talented Meghan McCarthy offers readers an explanation as to how Chester Greenwood (from Maine) was credited with inventing earmuffs. The word “muff” has been around since the Middle Ages. Starting in the 1700s, people wore muffs on their hands to keep them warm. It wasn’t until 1858 when William Ware invented a type of muff that was named for different body parts “ear, cheek, and chin muffs.” Over the years other people improved on the design. Then along came Chester Greenwood. Born in 1858, rumor has it that Greenwood had large ears that were sensitive to the cold. After testing various versions of muffs to keep his ears warm, Greenwood got a patent from the US government for a new improved design at age nineteen. By 1939, two years after Greenwood’s death, only he was remembered as the inventor of earmuffs. McCarthy’s wit is evident in her writing and comic illustrations in this informational picture book. Back matter includes a note about the book, explanation on patents, and bibliography. Highly recommended when studying inventions and/or creativity. Learn more about Meghan McCarthy at PW. The title and huge eyes have captured my attention. And I love informational books. It's a must read for me.